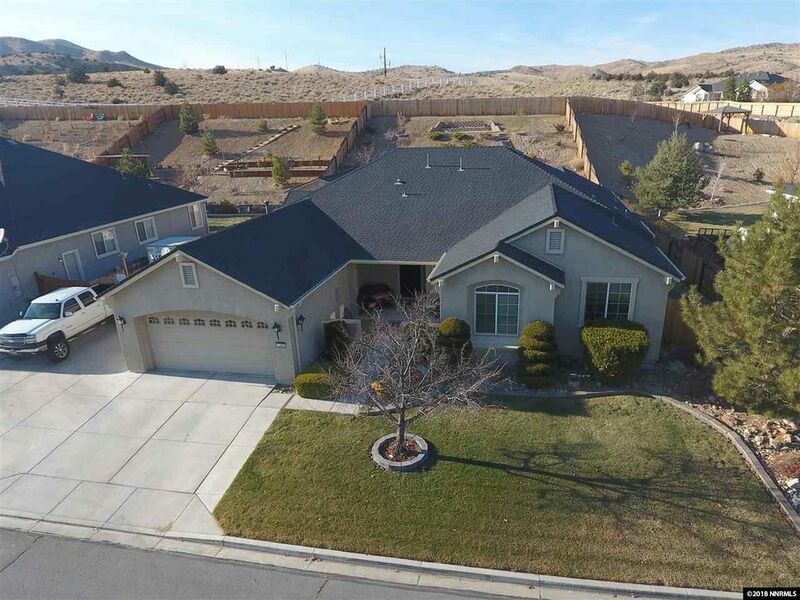 Large Lennar home with huge paved RV parking, extra garage/shop, storage shed and office! Very open floorplan with 10' ceilings, laminate & 18 tile flooring! The open kitchen has granite counters & splash, large pantry, breakfast nook and a huge center island with veggie sink. Stainless steel appliances include a 5-burner gas range and a very nice refrigerator. The large laundry room has lots of cabinets, sink and a private door to the yard. Washer & dryer are also included. Please see the 3D Virtual Tour! The combo dining/formal living room are the perfect area for your Christmas Tree! Family room has a gas fireplace and large media niche. Master bedroom has its own door to the patio. Master bath has 2 sinks, large soaker tub and walk-in shower. Oversized 74 gallon water heater. Hot water circulation pump. The shop has a conduit run to it for future electrical service, and a roll-up door. Garage has extra cabinets, insulated doors, epoxy floors and 220v service. Alarm service is rented, but can be assumed. The back yard is fully landscaped with terraced paths and sitting area high above to enjoy the views. The back patio has been freshly painted. Full rain gutters and lots of bird defenses all set-up. Fruiting plum tree in the front yard. The RV gate is well constructed of welded metal tubing. Lots more extras here, so come take a private tour!